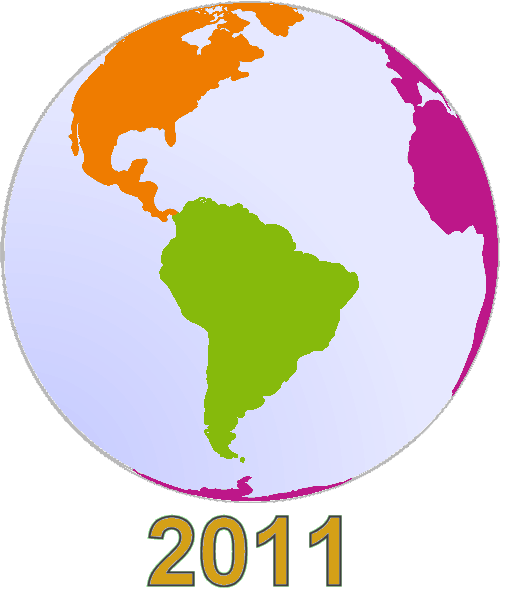 We have been maintaining Sweet Tools, AI3‘s listing of semantic Web and -related tools, for a bit over five years now. Though we had switched to a structWSF-based framework that allows us to update it on a more regular, incremental schedule , like all databases, the listing needs to be reviewed and cleaned up on a periodic basis. We have just completed the most recent cleaning and update. We are also now committing to do so on an annual basis. Thus, this is the inaugural ‘State of Tooling for Semantic Technologies‘ report, and, boy, is it a humdinger. There have been more changes — and more important changes — in this past year than in all four previous years combined. I think it fair to say that semantic technology tooling is now reaching a mature state, the trends of which likely point to future changes as well. In this past year more tools have been added, more tools have been dropped (or abandoned), and more tools have taken on a professional, sophisticated nature. Further, for the first time, the number of semantic technology and -related tools has passed 1000. This is remarkable, given that more tools have been abandoned or retired than ever before. Click here to browse the Sweet Tools listing. There is also a simple listing of URL links and categories only. We first present our key findings and then overall statistics. We conclude with a discussion of observed trends and implications for the near term. 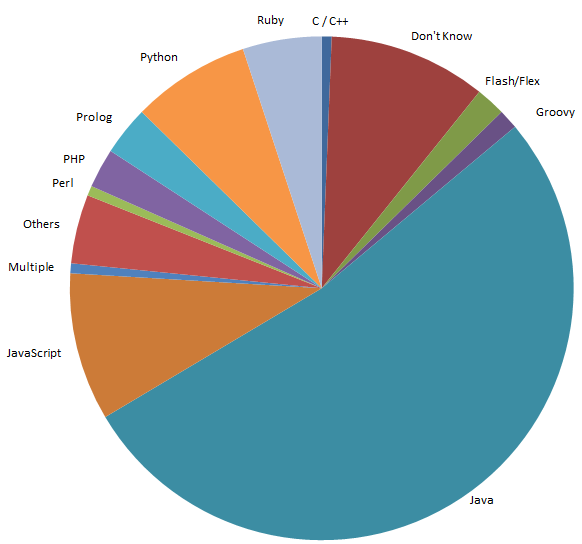 Java continues to dominate as the most important language. Many of these points are elaborated below. Though it is true that some of this growth is the result of discovery, based on our own tool needs and investigations, we have also been monitoring this space for some time and serendipity is not a compelling explanation alone. Rather, I think that we are seeing both an increase in practical tools (such as for querying), plus the trends of linked data growth matched with greater sophistication in areas such as ontologies and the OWL language. PHP will likely continue to see some emphasis because of relations to many content management systems (WordPress, Drupal, etc. 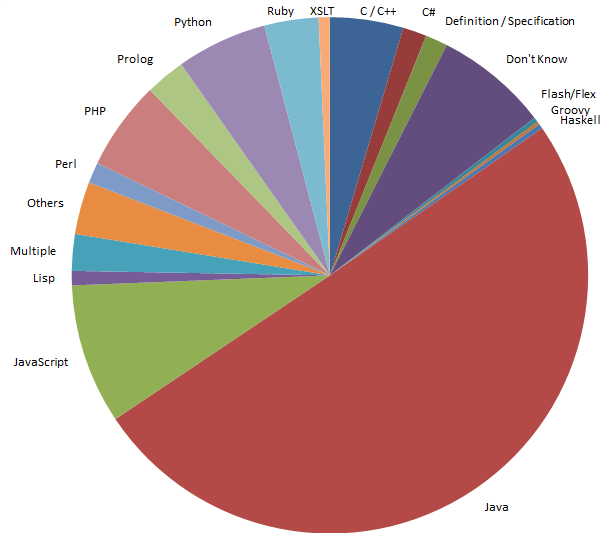 ), though both Python and Ruby seem to be taking some market share in that area. 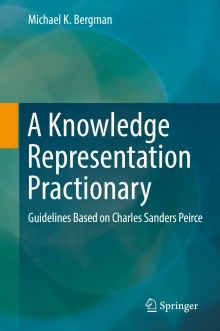 The higher incidence of Prolog is likely due to the parallel increase in reasoners and inference engines associated with ontology (OWL) tools. The increase in comprehensive tool suites and use of Eclipse as a development environment would appear to secure Java’s dominance for some time to come. These dry statistics tend to mask the feel one gets when looking at most of the individual tools across the board. Older academic and government-funded project tools are finally getting cleaned out and abandoned. Those tools that remain have tended to get some version upgrades and improved Web sites to accompany them. Google code over SourceForge for open source (and an increase in Github, as well) – virtually all projects on SourceForge now feel abandoned or less active. The largest source of open source projects in the semantic technology space is now clearly Google Code. Though of a smaller footprint today, we are also seeing many of the newer open source projects also gravitate to Github. Open source hosting environments are clearly in flux. I have said this before, and been wrong about it before, but it is hard to see the tooling growth curve continue at its current slope into the future. I think we will see many individual tools spring up on the open source hosting sites like Google and Github, perhaps at relatively the same steady release rate. But, old projects I think will increasingly be abandoned and older projects will not tend to remain available for as long a time. While a relatively few established open source standards, like Solr and Jena, will be the exception, I think we will see shorter shelf lives for most open source tools moving forward. This will lead to a younger tools base than was the case five or more years ago. I also think we will continue to see the dominance of open source. Proprietary software has increasingly been challenged in the enterprise space. 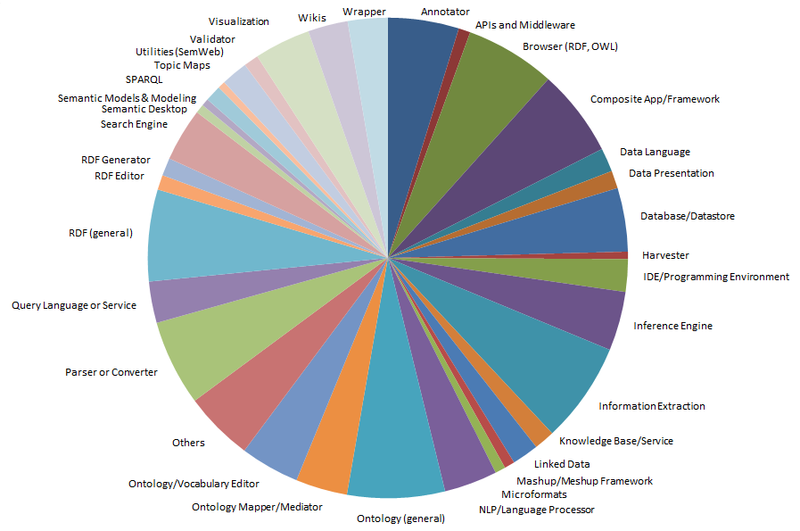 And, especially in semantic technologies, we tend to see many open source tools that are as capable as proprietary ones, and generally more dynamic as well. The emphasis on open data in this environment also tends to favor open source. Yet, despite the professionalism, sophistication and complexity trends, I do not yet see massive consolidation in the semantic technology space. While we are seeing a rapid maturation of tooling, I don’t think we have yet seen a similar maturation in revenue and business models. While notable semantic technology start-ups like Powerset and Siri have been acquired and are clear successes, these wins still remain much in the minority. Please use the comments section of this post for suggesting new or overlooked tools. We will incrementally add them to the Sweet Tools listing. Also, please see the About tab of the Sweet Tools results listing for prior releases and statistics. I’m not sure what process you use to discover tools but I wanted to point you to our new tool.. Butterflyzer. We’re calling it a “Content Intelligence Environment” and I think it’s pretty unique. And while it’s primarily web-orietented for now, it could easily be adapted to other semantic technologies. There is an open Beta Preview available now and we could really use feedback. Thanks for your insight about the state-of-art in various semantic tools. – this is indeed very interesting! Would you be happy to look at other semantic tools provided by Veda. We would be glad to bring to your attention other tools from our offering that include Veda Ontology Editor, Veda Ontology Reasoner and Veda Rule Engine. We were very happy to sponsor the recent Semantic Tech & Biz event at Washington DC as well. You may also visit our website http://veda.emudhra.com for a more comprehensive list of other semantic and text mining tools provided by Veda. Should you have any clarifications, do not hesitate to reach out to us on the website. I would be very glad if you could include RDFSharp (http://rdfsharp.codeplex.com/) in your listing of tools. It is a very new open source library for RDF management and it is written in .NET (C# language).